1. What can I do if my tenant has not paid the rent? The tenant must be served with a three-day notice demanding that the rent be paid or the tenant surrender possession of the premises within three days (excluding the day of service, weekends and holidays), unless the lease gives a different timeframe. 2. 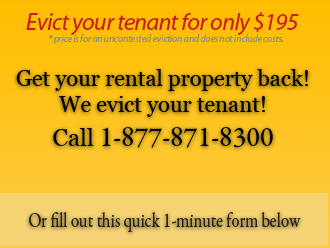 How do I evict a month to month tenant? You must serve the tenant with a notice stating that the month-to-month tenancy is terminated and demanding that the tenant surrender possession at the end of the monthly period. The notice must be served at least fifteen (15) days before the end of the monthly period, and the termination date on the notice must be the last day of a monthly period. 3. My tenant has failed to comply with the terms of the lease, other than non-payment of rent, and I want to evict. What can I do? If the non-compliance is such that the tenant should be given an opportunity to cure the non-compliance, the landlord must serve the tenant with a seven day notice to cure or vacate, stating the non-compliance, and stating that the tenant has seven days to correct the non-compliance or else the lease is deemed terminated and the tenant shall vacate upon such termination. Examples of such non-compliance include but are not limited to, unauthorized guests, pets or vehicles; failing to keep the premises clean and sanitary; disturbance of other tenants by loud noises. In addition, the notice should state that if the tenant repeats the same conduct or conduct of a similar nature within twelve months, the tenancy is subject to termination without a further opportunity to cure. 4. How do I serve a three-day notice, a seven-day notice or any of the other required notices? You may serve the notice yourself, or have it served by a process server that works with our firm. It is best to use a licensed process server since it eliminates mistakes and the process server will be perceived by the court as an impartial party with no stake in the matter. If you do it yourself, it's best to have some proof that you served the notice. 5. I posted a three-day notice, but the time has expired and the tenant has not paid nor vacated the premises. What happens next? After the period for a notice has expired, you should have an attorney file a Complaint for Removal of tenant which is served with a Summons on the tenant by the Sheriff or by a certified process server. The tenant has five days, excluding the day of service, weekends and holidays, to file an answer. If an answer is filed by the tenant, a hearing must be scheduled. If no answer is filed by the tenant, the attorney submits a Motion For Default, a Non-Military Affidavit, Final Judgment, and Writ of Possession. The Clerk enters a Default and the judge reviews the file. If everything is in order, the judge signs the Final Judgment. The file is sent back to the Clerk's office and the Clerk's office issues a Writ of Possession which is then sent to the Sheriff. The Sheriff then posts a twenty-four hour notice on the premises. The Sheriff will then call the landlord or the landlord's designated agent to inquire whether the tenant has vacated the premises. 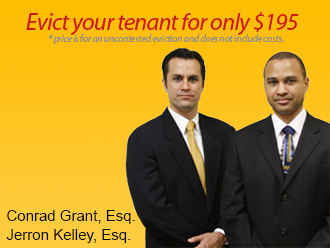 If the tenant has not vacated, the sheriff will accompany the landlord at a specified date and time, to keep the peace. With the Sheriff present, the landlord may remove the tenant's personal belongings from the premises. 6. Can I remove a tenant myself? No, you must follow the steps outlined by the Florida Statutes, which prohibit the landlord from directly or indirectly terminating or interrupting any utility service furnished the tenant, including but not limited to, water, heat, light, electricity, gas, elevator, garbage collection or refrigeration, whether or not the utility service is under the control of or payment is made by the landlord. You also cannot prevent the tenant from gaining reasonable access to the premises by any means such as changing the locks. You may not remove the tenant's personal belongings from the premises unless it is after the tenant surrendered possession of the premises; after the tenant has abandoned the premises; or after a lawful eviction. If you violate any of the above, you may be liable to the tenant for damages or three months rent, whichever is greater, plus costs and attorney's fees. 7. How long will it take to evict a non-paying tenant? The time required to evict a non-paying tenant in an uncontested eviction action can range from 4 to 6 weeks, depending on the particulars of the case and the Court's busy schedule. 8. What is the difference between an uncontested eviction and a contested eviction? Uncontested means the tenant does not dispute the eviction. If the tenant disputes the eviction and files any sort of answer, the eviction becomes contested. For example, if you sue to evict a tenant for nonpayment of rent and the tenant writes a letter to the court stating that he or she sent you the check, it becomes contested. 9. I want to sue for back rent. What do I need to do? Keep in mind that it's sometimes difficult to collect judgments against tenants. However, if you decide to sue for unpaid rent, add a count to your Complaint for unpaid rent. If the tenant does not dispute the amount of rent due, the Court will also issue a judgment for the amount of rent demanded in the Complaint.